Sarah Thomas-Clark grew up in the pest control industry like her father Craig Thomas. 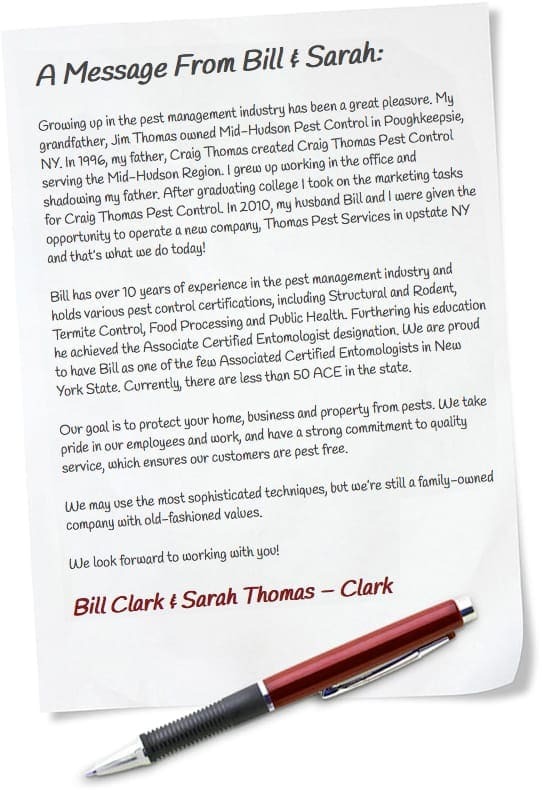 Craig’s father Jim Thomas started out in pest management in 1949, owning and operating Mid-Hudson Pest Control. Both Jim and Craig Thomas were instrumental within the pest management industry. In 2017, Sarah Thomas-Clark was awarded the Young Entrepreneur Award by the National Pest Management Association in Baltimore, Maryland. Sarah Thomas-Clark and Bill Clark; both operate Thomas Pest Services and are active members within the pest management industry. Thomas Pest Services Inc. was founded in 2010 with the acquisition of Hometown Pest Control of Hudson Falls, NY from Jeffery Smith in December of 2010. “I am confident that Thomas Pest Services will provide high quality pest management service to all my customers,” stated Smith. “The quality of Thomas Pest Services along with their family heritage and principles played an important factor in my decision.” Since 2010, Thomas Pest Services has grown and developed to be the premier pest management company in the Capital and Adirondack Regions. With strong dedication to education, sustainability, and employing the latest and greatest tools and technology in the fight against pests. Craig Thomas served on the board of directors of the National Pest Management Association (NPMA), QualityPro Board of NPMA and as President of the New York State Pest Management Association (NYSPMA). In addition to Craig's vast experience, Thomas Pest Services is a third generation family owned and operated Pest Management Company. Craig is proud of his daughter Sarah Thomas-Clark and son in law, Bill Clark; both operate Thomas Pest Services and are active members within the pest management industry. Craig Thomas believes that environmentally responsible pest control can be achieved without sacrificing our guaranteed quality. This concept has helped Thomas Pest Services become a leading innovator throughout the nation in the pest management industry. Thomas Pest Services provides pest control services for the entire Capital District as well as the Adirondack region and offers a full line of integrated pest management services, including bed bug heat treatment, termite baiting, insulation and more. Our mission at Thomas Pest Services is to provide high quality service experiences, guaranteed customer satisfaction by caring, engaged professionals. At Thomas, we uphold the Thomas Promise: We CARE! Committed in a partnership approach by educating and providing written information to produce proper results. Our employees are enthused team members, focused on continuous improvement in solving pest problems. Showing up on time when promised. Respectful of our customer’s family, pets and property. Solving pest problems, sustainable to protecting client’s health, property and the environment. Thomas Pest Services proudly serves the Capital District with 3rd generation experience you can trust. Thomas Pest Services is proud a proud member of many local and national organizations. See our list of professional affiliations and memberships who support our company’s mission, while increasing our overall professionalism. We care about our customers! What does being QualityPro certified mean? Thomas Pest Services is proud to be QualityPro certified. The QualityPro seal means a business has been certified for the highest standards in the industry by the National Pest Management Association. QualityPro certified businesses are certified in four important areas: trusted consumer relations, certified business practices, expert employee training and environmental stewardship. We feel it is important to be active in the community. Thomas Pest Services is proud to contribute to many local and national organizations. We care about our community! According the NPMA, in 2010 61% of consumers seek out pest control services they perceive as green. At Thomas Pest Services, we realize our customers want to be confident that the services performed in their homes are environmentally responsible and are proud to reflect green thinking in both our practices and our business philosophy. Rechargeable flashlights – instead of single use batteries. Handheld technology – reduces paper usage, efficient routing and scheduling. Online account management– View anywhere with access billing history, service history, material usage history, customer documents and more. At Thomas Pest Services, we are striving to become more efficient in every way. While eliminating pests is our main concern like it is yours, we also care about protecting the environment and with our practices are have the ability to do both. Thomas Pest Services is the proud recipient of the 2013, 2014, 2015, 2016 and 2017 Angie’s List Super Service Award. Winners have to meet strict eligibility requirements, which include an “A” rating in overall grade, recent grade, and review period grade; the company must be in good standing with Angie’s List, pass a background check and abide by Angie’s List operational guidelines. In 2009, Sarah Thomas-Clark was the recipient of the Professional Women in Pest Management Scholarship, an affiliate group of the National Pest Management. The PWIPM Scholarship is a national award, awarded annually to one female interested in advancing or securing a career in pest management. “Thomas understands the mission of PWIPM and its goal of strengthening the forces and network of women in the pest management industry,” stated the PWIPM Council. PWIPM provides a place for women in the pest management industry to network and learn from their peers, and has taken the initiative to define its role and the value of women serving in the industry. “It is an honor to be the recipient of this award,” said Sarah Thomas-Clark said at the time. "I absolutely love my job and the pest management industry. I hope to follow in my grandfather and father’s footsteps continuing the family business. This is just the beginning of an exciting career ahead of me." In today's increasingly complex and highly-specialized economy, credentials are so important. The Entomological Society of America, long the industry leader in certification and offers the Associate Certified Entomologist (ACE) certification. This certification has been designed especially for professionals whose training in entomology has been achieved through continuing education, self-study, and on-the-job experience. In New York State there are less than 75 ACE Certified. Thomas Pest Services is proud to have their own “pest expert.” Bill Clark is our in house Associate Certified Entomologist! Albany, New York, November 7, 2017– Sarah Thomas-Clark, Vice President of Thomas Pest Services was awarded the 2017 Young Entrepreneur Award by the National Pest Management Association in Baltimore, Maryland on October 19, 2017. The National Pest Management Association's (NPMA's) Young Entrepreneur Award, presented by Rentokil-Steritech, recognizes young entrepreneurs (40 years of age or less) working in the professional pest management industry who have helped create or develop an industry business and/or those who have stewarded a meaningful industry concept to fruition. As a third-generation pest management professional, Thomas-Clark began working in the industry as a teenager, where she was given the opportunity to find her roots and excitement for the industry. “I am honored and humbled to be this year’s recipient of NPMA's Young Entrepreneur Award and be the first female to have received the award,” said, Thomas-Clark. Thomas Pest Services is a local, family owned and operated company serving the Capital Region and Adirondack Regions. Thomas Pest Services is a QualityPro Company providing Pest Management, Bed Bug Thermal Remediation, TAP Insulation and Wildlife Removal Services. For more information contact Thomas Pest Services at 518-458-7378 or email at sthomas@thomaspestservices.com. To achieve Associate Certified Entomologist (ACE) status, Thomas Pest Services must have a minimum of seven years of verifiable pest management experience. They must have the knowledge and ability to pass a rigorous test on insect pest control, a current U.S. pesticide applicators license, and a willingness to adhere to the ACE Code of Ethics. In today's increasingly complex and highly-specialized economy, credentials are so important. The Entomological Society of America, long the industry leader in certification and offers the Associate Certified Entomologist (ACE) certification. This certification has been designed especially for professionals whose training in entomology has been achieved through continuing education, self-study, and on-the-job experience. In New York State there are less than 75 ACE Certified. Thomas Pest Services is proud to have two “pest experts.” Bill Clark, President and Bob Gaul, Director of Service are our in house Associate Certified Entomologists! At Thomas Pest Services, we are really good at getting rid of insects, rodents and wildlife that cause trouble. Our New York pest control company offers a full line of pest control and wildlife removal services in Albany, Troy and the entire Capital District and Adirondack region. If you're seeing pests or simply want to be proactive in your fight against unwanted houseguests, contact us today!